Contact Us to fulfil your order requirements and payment method. These are paper targets. They can be attached to any reasonable backing (timber, cardboard, plastic) using tape, staple, glue, etc. This is as Australian as it comes. Stunning colour contrast, and very good quality. Note: These pins come with every membership. Additional pins, $5ea. Record all your results with this classification card, which also serves as a quick reference guide to your historical results, and some other useful high power rifle information. These 85mm diameter, iron-on, patches are high quality with gold metallic thread to make them really stand out. SUGGESTED IRON ON PROCEDURE. Note: No responsibility is taken for the following, as it is provided with good will. position until garment is cool (perhaps 15minutes?). 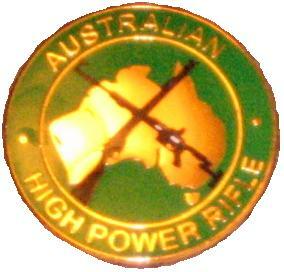 Australian High Power Medals (Rifle & Pistol). These 55mm diameter medallions are 3mm thick, with ribbon loop, and have a 30x30 square recess in the rear for the sticking of engraved name plates. These are NOT FOR SALE to individuals, but can only be earned by successful completion of an AIHPA or sanctioned HPR event. Host clubs etc may purchase these medals for their sanctioned events. Contact AIHPA for details. Refer to the Qualification section of this site to know how to earn all your qualification rockers. This Qualification header patch will sit nicely above your qualification rockers. These rocker patches are eligible to AIHPA members only after having completed the relevant qualification levels in sanctioned matches only. Refer to Qualification Section. Each patch must be applied for to AIHPA by the shooter as each relevant level is reached. - Red & white rockers, $3ea. In addition to the qualification patches, these pins are available by successful completion of each relevant phase of the qualification program. They are ordered by request only. Something every HP shooter should have close by. These are the rules for HPR which is used by the NRA and AIHPA to govern our events. This book covers all sub-disciplines - Across the Course, Long Range and Palma. (Note: AIHPA also enforces layover Australian by-laws which are outlined on the AIHPA website). Some clubs in Australia, and many around the world, make this item compulsory. It is inserted into the rifle action when the bolt is back so the firearm can easily be identified with an empty chamber and open action. Fit .22 and up.